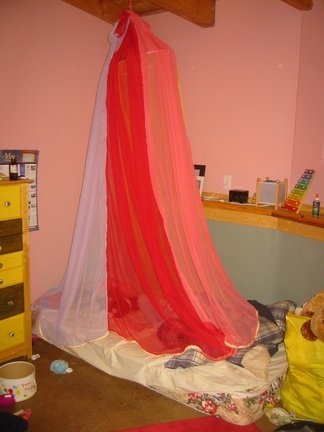 First I cut out three panels of fabric all the same size (9″ on top, 24″ sides, and 21″ on bottom). Then I hemmed the sides of each piece and sewed them together (leaving a strip ~2″ in between two of the strips that was not sewn together. I hemmed the top, leaving a small gap and enough space to thread an elastic in. 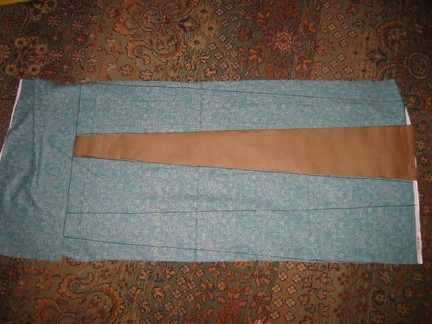 I threaded 19.5″ of elastic (since Kaia’s waist is 20″) and sewed closed the little hole that I put the elastic in through. I then hemmed the bottom so that there was a 1/2″ gap to thread in 1/4″ flexible tubing (I used some plumbing tubing). 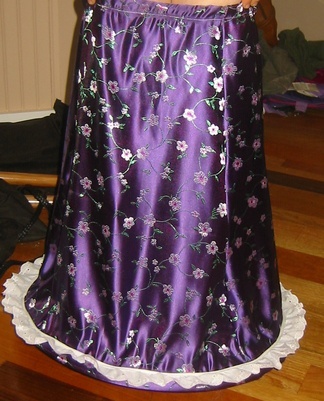 Along the hem, I used some lace for decoration, and to conceal the hoop. (Remember that 2″ strip on the bottom where the sides weren’t sewn together? 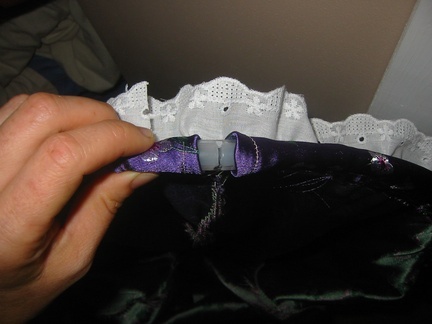 Once you hem it, it leaves a gap where you can thread in the tubing, and take it back out if you don’t want to use the hoop.) Thread the tubing in (~5 feet of tubing) and use another piece of tubing that has an inner diameter the same as the outer diameter of the hoop tubing to hold the hoop together. When she walks the hoop holds the dress out away from her… and it has ‘great spin’, which is very important to an almost 5 year old! And the whole thing cost me ~$10. I also found a skirt in a magazine that I really loved, but it was way out of my price range. So, I tried my hand at making that too. First I needed 20 ‘strips’ of fabric. 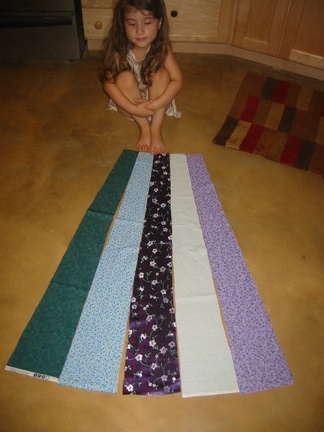 I used 4 strips each of 5 different fabrics. I cut out a piece of paper to trace my strips from. Here you see the paper and the pieces traced, before I cut them up. 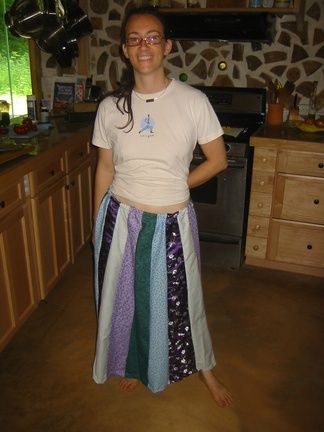 I like it, but it’s not as ‘flowy’ as I had hoped it would be… then I realized that the skirt in the magazine is made of silk, and I used mostly cotton. I’ve also been gathering some herbs on the land for medicine. 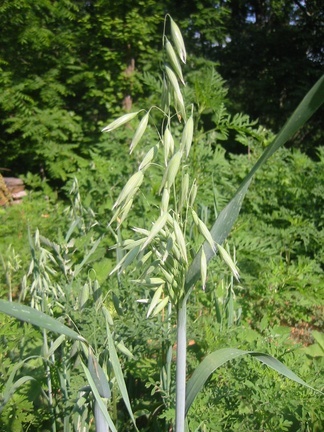 I also harvested some oats in milky stage to make tincture out of. 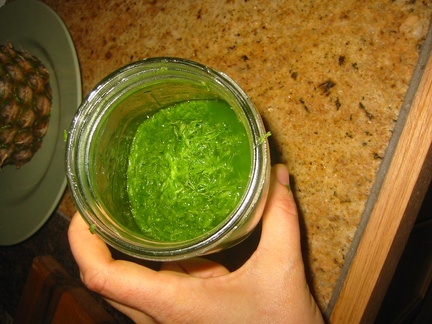 The tincture is SOOOO green! This entry was posted in Holistic Medicine, Mothering. Ooooh!!! 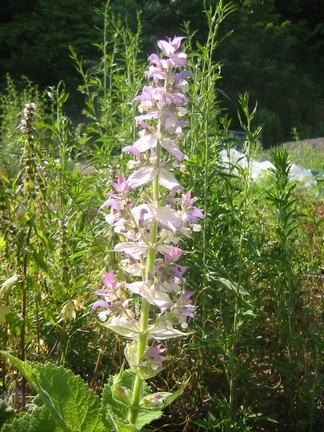 Gorgeous plants – they are so much bigger and farther along in their growth than they are up my way in MA. 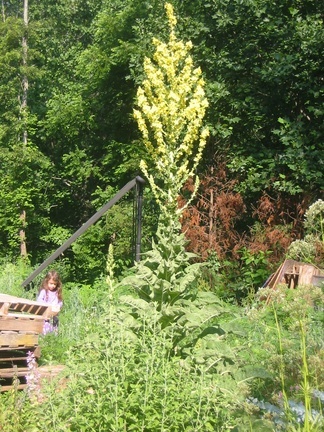 Is that St John’s Wort in front of the Mullein? Hard to tell from the picture, but I was just outside searching for it myself, so I’ve got it on the brain. Love the skirt as well – I’m going to have to try that technique out myself. Nope, it’s actually catnip in front of the mullein. The St. John’s should be blooming soon though… here anyway. Where are you in MA?